Samsung is using its new S9 and S9+ smartphones to up its smart home game with an all-new SmartThings app. Included with the S9 duo when they go on sale in March, the new app aims to be a one-stop-shop for controlling everything in your smart home. With a new interface which is consistent across devices - Samsung smartphones, TVs and fridges, for instance - the new SmartThings app is a clear move by the South Korean company to rival Amazon Alexa, Google Home and Apple's Home for control over your connected home. But unlike those services, which are powered by Alexa, Google Assistant and Siri respectively, Samsung is launching the new SmartThings app without a single mention of its own voice assistant, Bixby. Bixby is far from dead - indeed, the S9 has a dedicated button for summoning it - but Samsung seemingly isn't ready to take on Alexa and Google Assistant directly just yet. For now, the new SmartThings app is focused on controlling all of your home gadgets and appliances from one place - and by tapping the screen instead of speaking out loud. Consistency is key here, as the SmartThings app looks the same on Samsung smartphones like the Galaxy S9, as it does on the company's televisions. The interface shows buttons for switches devices on and off, and allows you to group devices by the room they are in. There is also a way to design presets for certain times of day - for example, a setting called 'goodnight' can be activated to switch all lights off and lock your doors when requested. Third-part devices which can be controlled by SmartThings include those by Ring, LIFX, Philips Hue, Yale, Bose and more - plus washing machines, dryers, plugs and vacuum cleaners by Samsung itself. Samsung claims the app was designed to "remove the complicated steps that are often required to complete everyday tasks and chores, and does so by fostering seamless interactions between a household's IoT [internet of things] technologies." Together with the Galaxy S9, Samsung claims the new SmartThings app offers users "all the tools they need to keep their household running smoothly, and streamline how they connect and share with one another to enjoy content." To that end, the app can be used to not just send an image to a contact, but you can pick which device to send it to. Say you have taken a photo while out on a walk and you know your friend will be at home; you can send the photo to their TV. Images can also be sent directly to Samsung Family Hub smart fridges, or other compatible devices. SmartThings also removes the need to open each manufacturer's smart home app to interact with their devices. For example, the video feed from compatible doorbells can be streamed right to the SmartThings app on any compatible device. Finally, getting new smart devices logged onto your Wi-Fi network and connected to your Samsung account is aided by the SmartThings app. The app lets you transfer login information from your Galaxy S9 to new devices and the apps held on them. 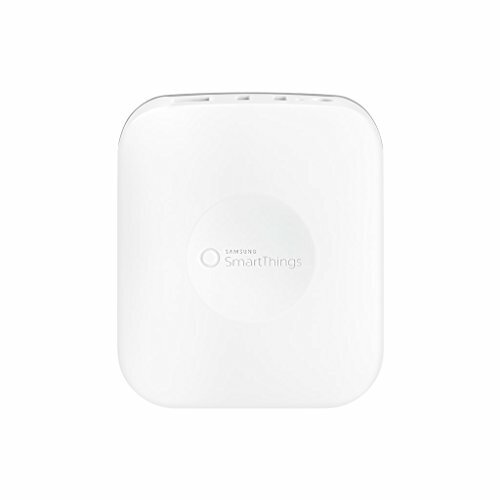 Check out The GearBrain to see which connected devices work with or are compatible with Samsung SmartThings platform.